Andrew McKenna is chairman of Schwarz Supply Source, a leading provider of supply chain solutions. 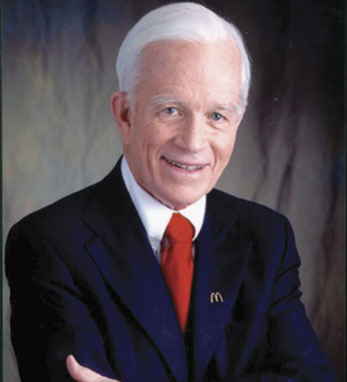 He is also chairman of McDonald’s Corporation and serves as a director of Ryan Specialty Group, McDonalds Corporation, and the Chicago Bears Football Club Team and Skyline Corporation. Over the years, Andy has served on many civic boards. He is a director of the Ann & Robert H. Lurie Children’s Hospital of Chicago, the Big Shoulders Fund of the Archdiocese of Chicago, the Ireland Economic Advisory Board and the Lyric Opera of Chicago. A graduate of the University of Notre Dame with a BS in business administration, he was awarded the university’s Laetare Medal in 2000. He served as the chairman of the board of trustees from 1992-2000 and continues on the board today. He is also a graduate of the DePaul University Law School where he received a Doctor of Jurisprudence. A second-generation Irish American, with roots in Mayo and Monaghan, he and his wife, Joan, have seven grown children, 24 grandchildren, and two great-grandchildren.